The shop floor user interface has been designed to be simple and intuitive, presenting the data in a format that users on the shop floor are used to and comfortable with. Shop floor users record labor usage, output, scrap and completion against operations on a production orders or multiple production orders. Production orders can be selected from a dispatch list or by scanning a production order traveler report equipped with barcodes. Capturing labor time is very simple and depending on configuration can be manually entered or calculated based on scan times. Supervisor capabilities are extended with the ability to manage set up time, capture set up time independent of run time, and deduct break times manually or by scanning a barcode. Security of the shop floor interface has been designed to be simple but effective. Users scan their badge to log in, start working on a production order and log out. There is also a configurable timeout that can be setup which ensures that data is accurately captured for each user. 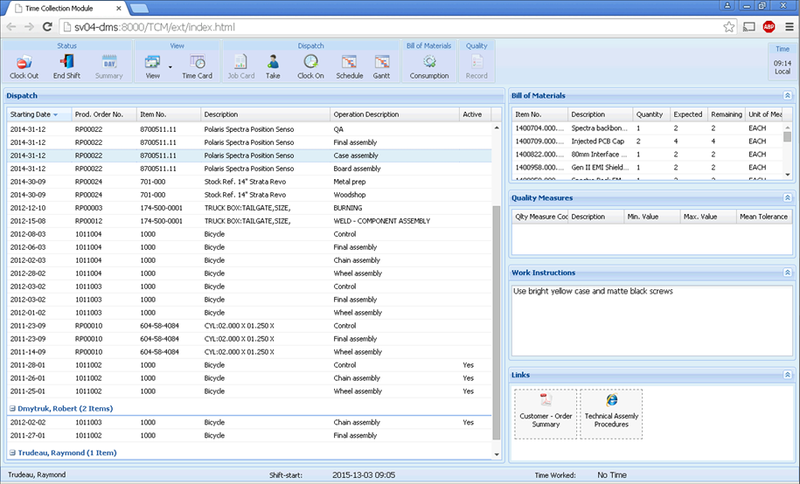 Shop Floor Insight enables users to create user interface profiles for users, groups and even globally. A configurable user interface means Shop Floor Insight can easily be tailored specifically to your production environment to improve shop floor efficiency. By assigning colors to various components, users will easily configure Shop Floor Insight to provide better visibility when viewing time cards. For example, Shop Floor Insight can highlight time card tasks that are still open making it easy for production workers to identify tasks, or identify if an employee is clocking setup or run time.